With so much media coverage of nutrition recommendations for the prevention of cardiovascular disease (CVD), it’s no surprise that consumers are confused about how best to structure their diets. Even RDNs may find it challenging staying up-to-date on the latest science and interpreting the findings of new studies. This session will examine the most current dietary recommendations for the prevention of CVD, the science behind these recommendations, discuss current controversies and the underlying science, the key strategies that RDNs can implement to deal with controversies, and make food-based dietary recommendations to translate to a healthy dietary pattern. Attendees will learn about practical approaches to counseling patients and clients about saturated fat, polyunsaturated fat, sodium and cholesterol, to reduce risk of CVD. The program will also cover the American Heart Association’s Presidential Advisory on Dietary Fats, published in June 2017, and the public debate that surrounds this. RDNs are well positioned to teach/counsel on a food-based approach as a strategy for CVD prevention that can help people move beyond the controversies. Understand why there are some misunderstandings (controversies) about the current Dietary Guidelines for SFA, PUFA, cholesterol and sodium. Address these controversies in practice using food-based recommendations. 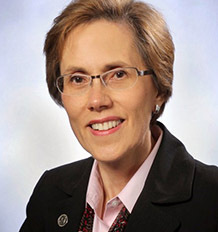 Dr. Penny Kris-Etherton is Distinguished Professor of Nutrition in the Department of Nutritional Sciences at The Pennsylvania State University, where she has been on the faculty since 1979. Dr. Kris-Etherton’s research expertise is cardiovascular nutrition. She conducts controlled clinical nutrition studies designed to evaluate the role of diet on risk factors for cardiovascular disease (CVD). Dr. Kris-Etherton has served on many national committees that have established dietary guidelines and recommendations. She served on the 2nd Adult Treatment Panel of the National Cholesterol Education Program, the Dietary Reference Intakes for Macronutrients Committee of the National Academies, the HHS/USDA Dietary Guidelines Advisory Committee 2005, and Chaired the Nutrition Committee of the American Heart Association that published diet and lifestyle recommendations for the prevention and treatment of CVD. She is a Fellow of the American Heart Association, the National Lipid Association, and the American Society for Nutrition. She is the recipient of many awards. Dr. Kris-Etherton has published over 350 scientific papers, 30 book chapters and co-authored 4 books. Dr. Penny Kris-Etherton reports the following relevant disclosures: she serves on the scientific advisory boards of CA Walnut Commission, Avocado Nutrition Sciences Advisors, Seafood Nutrition Partnership, TerraVia, and HumanN. She has received grant support from CA Walnut Commission, Canola Oil Council, McCormick Spice Institute, National Cattlemen's Beef Association, Ocean Spray, California Strawberry Commission, INC (International Nut Council). She has certified that no conflict of interest exists for this program. View our disclosure policy.